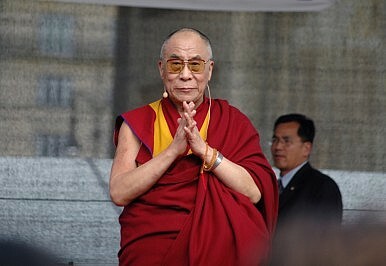 4 Nobel Laureates will boycott an upcoming summit in Cape Town to protest the exclusion of the Dalai Lama. Earlier this month, reports emerged that South Africa denied a visa to the Dalai Lama, preventing him from attending the World Summit of Nobel Peace Laureates to be held in Cape Town from October 13 to 15. As the summit draws closer, Nobel Laureates and Tibetan activists are leading a campaign to pressure the South African government to reverse course. Cape Town’s mayor, Patricia De Lille, called this “disingenuous” in a written statement. “The fact is that on the basis of the National Government’s telephonic contact with the office of the Dalai Lama, it was clear that his application was going to be refused and His Holiness withdrew his application to avoid any further embarrassment,” De Lille wrote. She called the decision to deny the Dalai Lama a visa “appalling.” “It is indeed a dark day for South Africa when the ideals for which Nelson Mandela and so many others fought are sold to the highest bidder,” De Lille said. In the press release, TNC President Jigme Ugen said, “The world needs this summit and no authoritarian government should be allowed to control it by censoring which voices gets heard.” Ugen added, “We also believe that the summit will be irreparably tainted by accepting and implicitly endorsing the bullying tactics of the Chinese government.” TNC also released a petition asking Nobel Peace Laureates to boycott the summit. According to Mayor De Lille, the foundations of South Africa’s own four Nobel Peace laureates (Nelson Mandela, Albert Luthuli, Desmond Tutu, and FW de Klerk) also planned to write letters to President Zuma asking him to grant the Dalai Lama a visa. A representative from the Mandela Foundation told The Diplomat that the foundation was “still gathering information to understand his [the Dalai Lama’s] retraction” of the visa application. A September 4 statement from the Mandela Foundation noted the DIRC’s insistence that the Dalai Lama’s visa was being processed normally. “We look forward to being in attendance at the 14th World Summit of Nobel Peace Laureates in Cape Town together with His Holiness and other laureates,” the statement read. The Tutu Foundation, and De Klerk Foundation did not immediately respond to requests for comment. Ironically, it might have been better for China if the South African government had simply granted the Dalai Lama a visa, thus avoiding both an ugly controversy and waves of publicity for the Dalai Lama and Tibetan activists. The timing is particularly bad as China recently sentenced Uyghur professor Ilham Tohti to life in prison on charges of separatism. Some observers, including Chinese writer Wang Lixiong, have compared Tohti to South African national hero Nelson Mandela (a comparison Chinese media and officials have fiercely rejected). That only provides more fuel for human rights advocates who argue that China’s government is fundamentally at odds with the values the World Summit of Nobel Peace Laureates seeks to promote — and that the South African government is betraying Mandela’s own values by giving in to Chinese pressure.